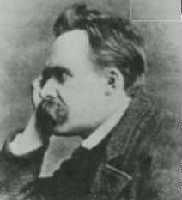 Born in Prussia, the son of a Luthern minister who died insane four years later, Nietzsche spent the years of chilhood with his mother, sister, and two maiden aunts. In 1858 he he entered boarding school, and in spite of poor health went on to study theology and classical philosophy at the University of Bonn, and then removed to Leipzig, where he became influenced by Kant, Schopenhauer, and the composer Richard Wagner. A year in the army in 1868 was cut short by illness, but his intellectual distinction was such that in 1869 he was appointed to the chair in philosophy at Basel, although at the time he was only 24 years old, and had none of the formal qualifications usually required. In 1879, Nietzsche resigned from the university because of his chronic ill healt, and on a modest pension devoted the rest of his time to writing. In 1889 Nietzsche collapsed on a street in Turin, unable to bear the sight of a horse being flogged, and for the remaining years of his life was clinically insane. It is generally accepted that during the years towards his death (and after it) his sister and guardian, Elisabeth Förster Nietzsche, played a role in muddying the channels of Nietzsche's influence on German life. Also sprach Zarathustra (Thus Spoke Zarathustra) (1883-1885). Also available - Study Guide by Professor Paul Brians. A Bibliography of Nietzsche. Compiled by J.F.Humphrey. Bibliography in English and German. Last modified September 15, 1995.